Last but not least, here is my report from the Krita 2014 sprint. It was the fourth Krita sprint and the first one since the previous sprint 2011. In terms of Krita development that a really long time and quite a lot happened since then. After the last sprint in Amsterdam the sprint location was once again in Deventer. As usual the sprint was again very productive and generally fantastic with lots of old faces and some new ones. Most of the discussion was around planning for the next two versions which will be 2.9 and 3.0. With 3.0 we will make the step to Qt 5/Frameworks 5 so 2.9 will be used to finish all the ongoing development to make a clean port. We learned a lot from KDE 4 in this regard and this time we will port a lot later and also won’t don’t any other changes beside the port. Due to the upcoming port Krita 2.9 will be one of our most ambitious releases ever. The biggest new feature will certainly be that Krita will be able to handle multiple images in the same window. There is also a fundraiser in preparation to push the release even more. After the main sprint concluded I workde on some problems the artists pointed out. The screenshot below shows some of the improvements that I made as a result of suggestions during the sprint. The smoothing setting in the tool options is now a button group instead of a combobox, which makes switching between different modes much faster. The composition docker now has checkboxes to control which compositions will be exported. It also now possible to update a composition after it was created and rename it. 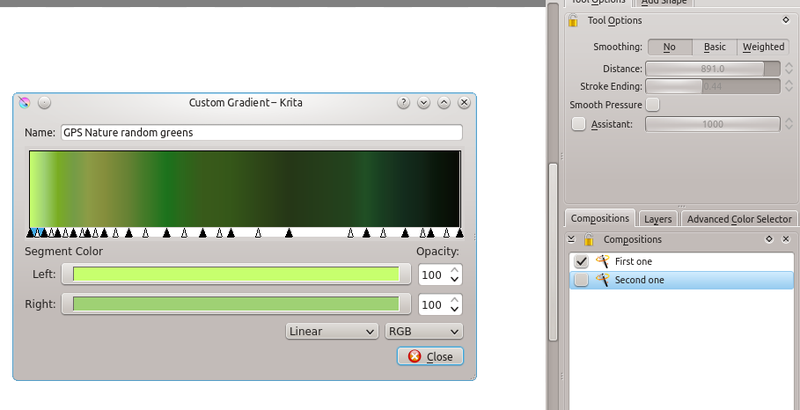 The gradient editor has seen some enhancements. It’s now possible to add new gradients and edit existing ones. The layout of the editor itself it also better now. Many thanks go to Boudewijn and Irina for the excellent hosting and to KDE e.V. for making the sprint possible. This entry was posted on May 31, 2014 at 3:48 am and is filed under Krita. You can follow any responses to this entry through the RSS 2.0 feed. You can skip to the end and leave a response. Pinging is currently not allowed. Awesome news!. One question, there is plan to implement conventional rulers and guides (with snap to guides) to make it also usefull for more conventional graphic design? Better snapping is on the list of things we need to address at some point, so it’s definitely planned. Currently other features have higher priority, so it might take some time for that. It might of course get done earlier if someone wants to pick it up. Great. Hope also to someday have classic guides from ruler and also percentaje and by coordinates ones, that will be a boost for use it for graphic design that already its interested due to its many feautures specially, its cmyk availability and fast opengl canvas. Sometimes I use it for convert and prepare images before put it in Scribus when I have to design thing that will be printed. hello sir your blog is really informative,,may i ask i have krita 2.8 and i like to know how to upgrade it to 2.9 ..?? thank you very much..
-arnie here from the philippines.